Is The Wire better than Breaking Bad? Is Cheers better than Seinfeld? What’s the best high school show ever made? Why did Moonlighting really fall apart? Was the Arrested Development Netflix season brilliant or terrible? What’s the greatest TV show ever? 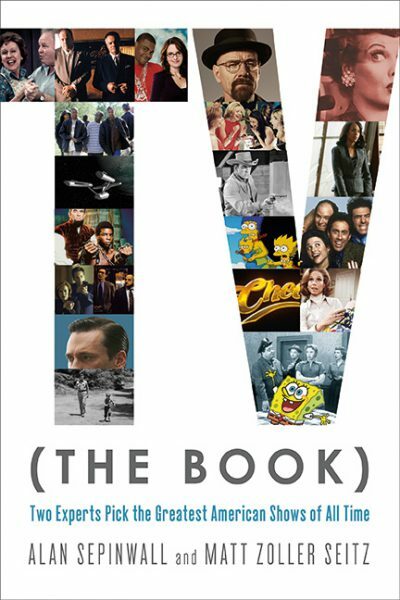 That debate reaches an epic conclusion in TV (THE BOOK). Sepinwall and Seitz have identified and ranked the 100 greatest scripted shows in American TV history. Using a complex, obsessively all- encompassing scoring system, they’ve created a Pantheon of top TV shows, each accompanied by essays delving into what made these shows great. From vintage classics like The Twilight Zone and I Love Lucy to modern masterpieces like Mad Men and Friday Night Lights, from huge hits like All in the Family and ER to short-lived favorites like Firefly and Freaks and Geeks, TV (THE BOOK) will bring the triumphs of the small screen together in one amazing compendium. Sepinwall and Seitz’s argument has ended. Now it’s time for yours to begin!